The new version of Fedena - 2.2 is released. This version of Fedena is released with i18n/RTL support. The detailed Release Note is available here. The new version of Fedena - 2.1 is released. The Release Notes is Available Here. The Source Code, User Guide and Installation Set Ups are available in the downloads page. The detailed installation instruction is available here. We are proud to inform that DHH (David Heinemeier Hansson - The Creator of Ruby on Rails) wished Best of Luck to the Project Fedena through E-mail. Since the launch of vesion 2.0 of Fedena, we have been receiving rave reviews about the project from all over. Great contributions are being received day by day and lots of Institutions have started to use the application for managing their school data. The factor that excited us is that, even individuals with no prior knowledge in RoR have shown interest in the application and they were successfully able to install, configure and use Fedena. They have also started to learn Ruby on Rails Technology to contribute to the project. Fedena application will be released as ISO soon. The distro is based on Turnkey Core Lucid and it will be available for download on their next release. At this point of time, we would like to thank Basil Kurian for the excellent contribution done by submitting the patch to the Turnkey Core Linux. The ISO can be used to install Fedena on a Cloud or any Hardware. The installation page of this website has been updated. You can now find the detailed tutorial for installing Fedena application on Windows and Linux platform here. Video tutorial for both is also available. We believe that the new video tutorials will help anyone with a little knowledge in computer to Install Fedena on their systems. Fedena 2.1 release with the bugs identified and addition of minor functionality. The latest Version of Fedena - Fedena 2.0 is now online. The new version of Fedena has lots of additional features, functionality and updates compared to its older version. The Entire Release Note is available here. The source code of the new version of fedena is available at github. Click Here to download the Technical Documentation of the project. The ER diagram of the project can be downloaded from this Link. This version of fedena is more optimized as it can be understood from its database design and we have replaced most of the images with CSS3 stylings. As the system now includes HR and Finance modules in addition to other modules, we believe that this new system will help in smooth functioning of Educational Institutions. Have a look into the demo and let us know your views on the application. Please do report bugs at the Bug Tracking System available on this community portal. You need to become the member of the community to report bugs. It is a pleasure to announce that we are invited to do a presentation at Debconf10. Fedena will be presented in the pedagogical freedom event on debian day by Ahamed Shameem. Fedena is now SMS enabled, which means you now have the choice of sending SMS notifications to the students, parents and employees regarding various events of the institution. SMS module is integrated into the core of Fedena. All you have to do is change the settings to suit your needs. Important reports are always printed in a school. In Fedena, a PDF report can be generated for most of your queries. Details are pulled from the database and a PDF is generated on-the-fly. Thanks to the prawn & prawnto gems . 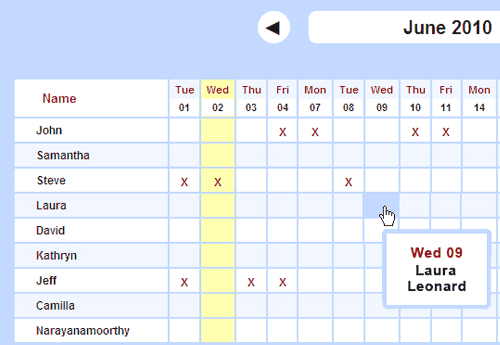 School calendar is a new feature that is being implemented. 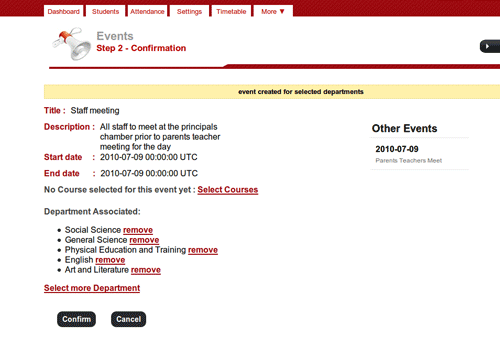 In a calendar you can create events for a particular department or class. Seeing the calendar you can see the daily life of your institution.Together with SMS module you can send out alerts for important events. All the operations related to managing employees is incorporated under the HR module. This module has also seen serious rework since version 1.0. You can generate the payslip for an employee , take a PDF report of it and print it right from Fedena. The finance module now has added features like one click payslip approval.The assets and liabilities management help to integrate existing finance management infrastructure of the institution into Fedena. Added to this Fedena 2.0 also features an import to Tally option.This option was included seeing the wide usage of tally for finance management in India. 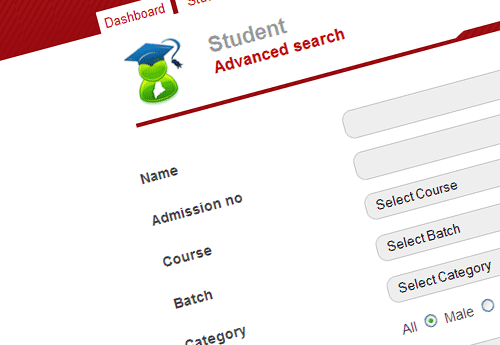 Students can be searched based on various criteria. This advanced search feature has been implemented for employees too. Exam Management has also been improved. In place editors have been placed so that essential details like exam title, maximum/minimum marks can be edited on the go. The grading system for exams has been reworked. Each exam can be created based on marks , marks and grade and grade only type according to the requirements. Elective groups are included into the subject logic. 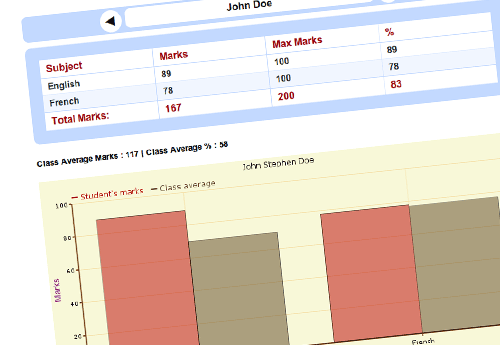 Students of same class can choose one of the subjects in an elective group.The exam results can be viewed as various reports and compared to each other. Timetable module has now an elegant timetable creator with drag and drop functionality. Thats all for now , We are still busy squashing minor bugs. We are eager to hear from you. Do report bugs and get your hands dirty with the code once the new version is released. Over the time, the team Fedena have been working on some of the major changes in the application. 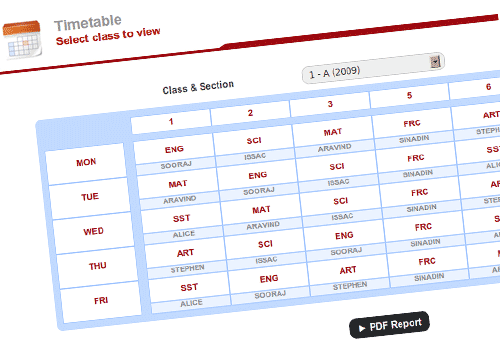 One such major change was done to the entire attendance module. 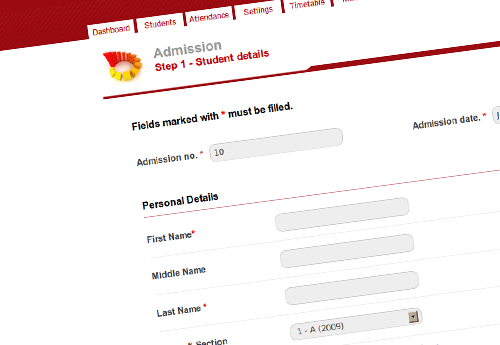 The previous version was lacking some of the basic functionalities which was way important to get the exact look and feel for an institution's attendance system. Unlike the older version, here we can find a clean and an eye catchy interface with easy to use functionality and how to's. This attendance system is designed in such a way that it will depend upon the timetable of the batch as well as the holidays of an Institution. 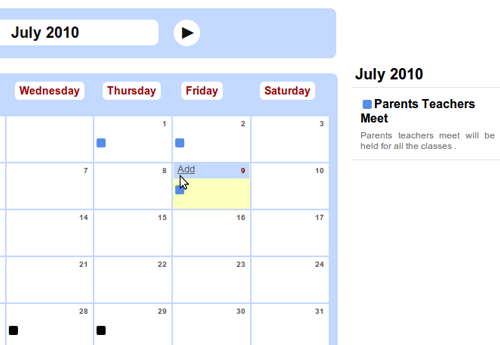 Similar to the older version of attendance module, here too there are two options available for marking an attendance. Either on daily basis, or per-subject basis. Just have these options set and the attendance register will bring up the necessary changes in itself according to the preferences you have set. 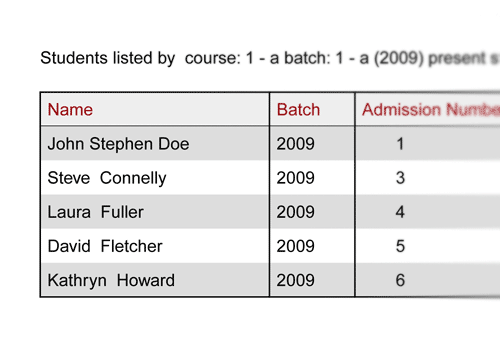 We have also been working on generating some useful reports for the attendance module which will give insight on students attendance over the academic year. With SMS feature enabled for the institution, sms reports will be delivered to the students guardian instantly when the attendance is being registered which will help guardians to get a better control over their wards regarding students attendance. What is Going On In Project Fedena ? It is almost one month since the launch of the official community website for Fedena - projectfedena.org. Within this short span of time lots of enquiries regarding the project have been received and we were also able to get immense contribution to the project from contributors all over the world. Now, we can have a look into the current happening of the project - fedena. Logic has been modified so that the system will be independent of academic year and the entire migration will be based on course-batches. All the historical data of the institution will be stored in a separate table and the queries will be modified to use memached with which we believe the performance of the system will be much better. 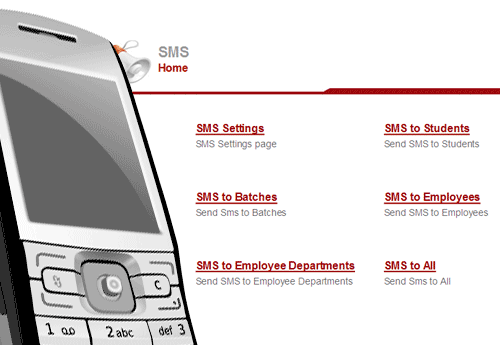 The plan for SMS module is over and its implementation will be started soon. arzumy - This member has reported some valuable suggestions for the project and has made the application heroku friendly. He is also writing some tests using cucumber. malozo - This member has shown interest in translating the application to Spanish language. I expect more contributions to the project in the coming days with which we can deliver the Best School Management ERP ever built. The first RubyConf India was held in Bangalore last month and featured presentations by some of the best known names from the ruby community including Ola Bini, Obie Fernandez and of course, Yukihiro "Matz" Matsumoto, who presented through a video conference. The entire Project Fedena team was at RubyConf and our project director Arvind GS was one of the speakers. Arvind gave a presentation titled "Project Fedena and Why Ruby on Rails". In the presentation, Arvind spoke about why we chose to develop Fedena with Ruby on Rails despite being new to both ruby and rails. He also spoke about our decision to make Fedena available as open source. The presentation slides have been uploaded and are available here. You can also find more info on the speakers page of the RubyConf site.